As we get closer to the Thanksgiving and Black Friday week here in the US, sales will start popping up all over the place. If you work retail in these next few weeks, I feel sorry for you. Regardless, there are some pretty great deals to be found. One such is the Bose QuietComfort 20 acoustic noise canceling headphones. They are marked down to $200, a savings of $50, at several major online retailers. These in-ear headphones feature noise canceling to shut out the world and an "Aware" mode to hear what's going on around you. They are designed to fit and stay in your ear while remaining soft and comfortable. And with the name of Bose, you can expect superb sound. Where this deal gets dicey is that you need to pay attention to which version is being offered. 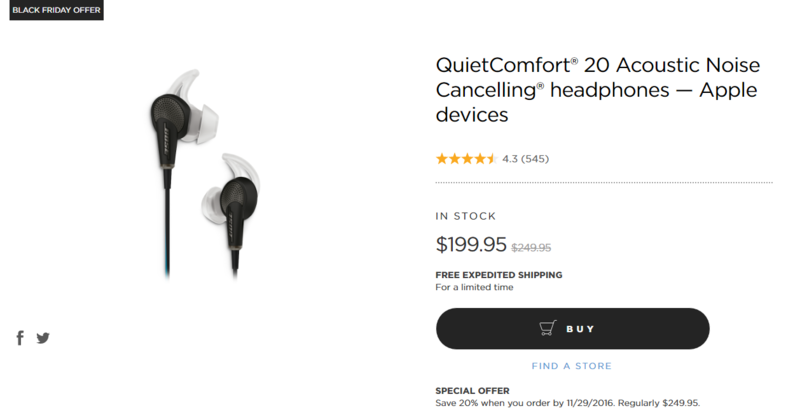 The QC20s come in either an iOS or an Android version for "compatibility" reasons (likely mic and remote functions). So pay attention when you go to the purchase links below.